Whoot Whoot! 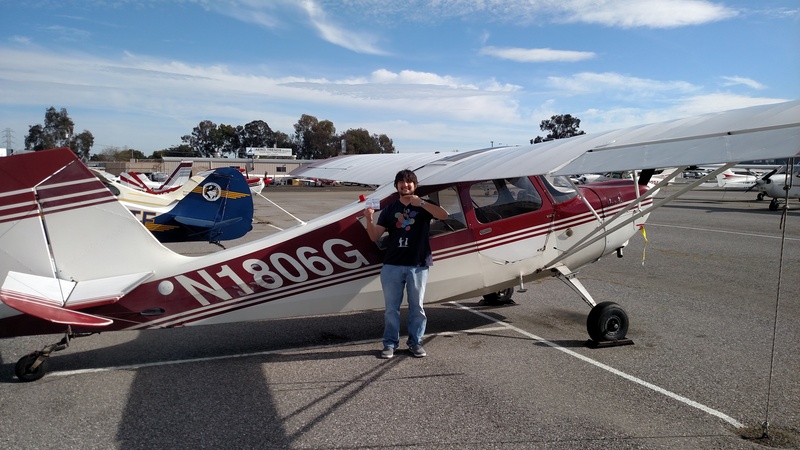 Congrats to AeroDynamic’s newest tailwheel pilot! 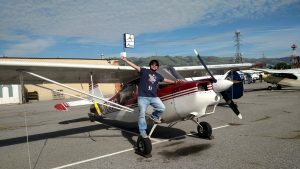 With a family of pilots, Shawn earned his wings and plans to fly for fun in his dad’s Cessna 120, another fun taildragger. 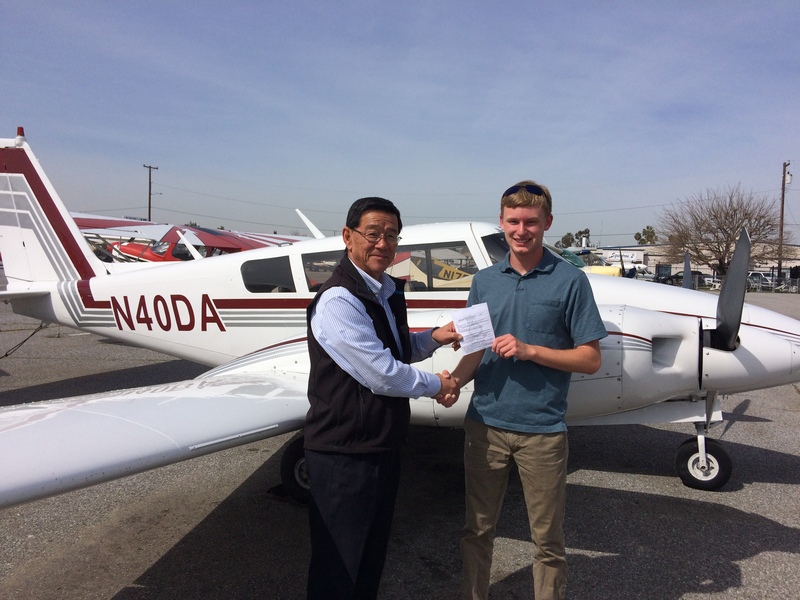 Shawn soloed in Citabria 990wY with us in November and passed his checkride in Citabria 1806G just a few days ago. 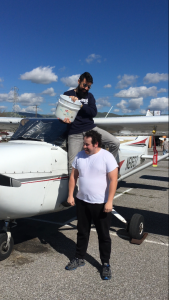 He flew to Calaveras Airport, at the base of the Sierra Mountains, to take his checkride with tailwheel examiner Rob Davids. And he passed with flying colors! Congrats to both Shawn and Jason for this achievement. Happy flying! It’s looking to be a banner year for Cessna 61637! 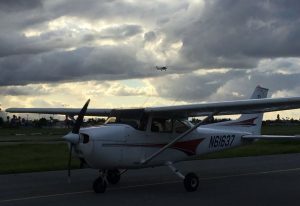 This Cessna 172M takes yet another student pilot, Kelsie, on her first solo flight around Reid-Hillview Airport’s traffic pattern. 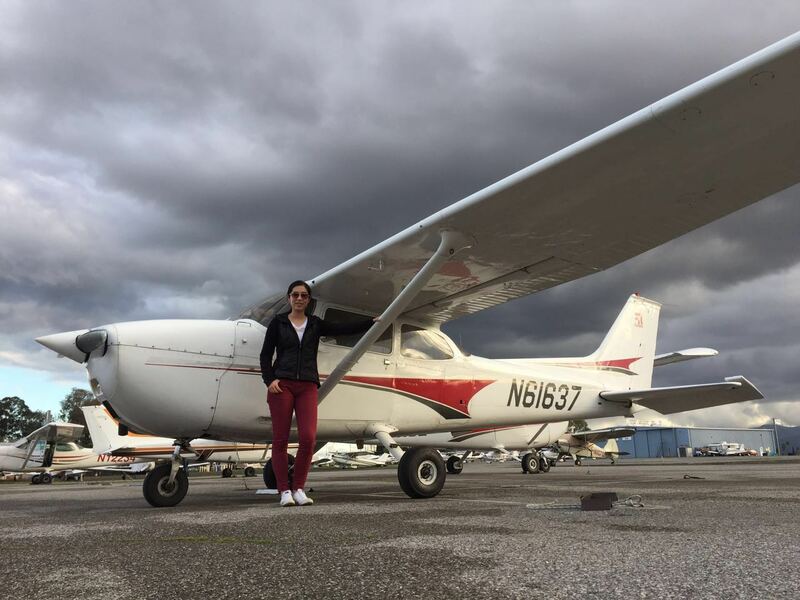 Soon this beloved airplane will also add Kelsie to her distinguished list of pilots who have earned their pilot wings in her white, red and gray airframe. 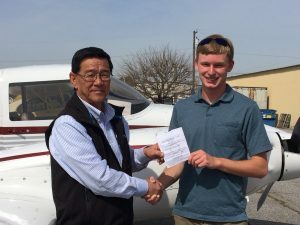 After recently earning his instrument rating with us, Monterey-based pilot JP O’Dell mastered our Twin Comanche in just 12 short hours and passed his checkride on the first attempt! 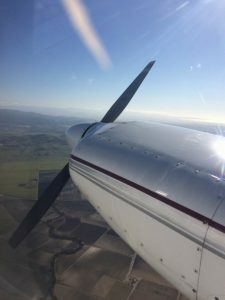 Despite being a full-time student and avid athlete, JP made time to study the Twin Comanche’s systems, emergencies, and engine-inop procedures. JP plans to continue on to a career in aviation (hopefully becoming a CFI for us), but for now the lucky 19-year-old has access to fly a Beechcraft Baron for a number of hours while he works toward his Commercial Pilot License. Try to avoid shutting down an engine anytime soon, and we will see you in a few months for that next pilot certification. Image: Right engine shutdown (feathered) in flight. 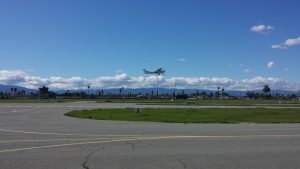 We love seeing fledgling pilots leave the nest and soar around the airport patch. AeroDynamic sends a big “way to go” to Henrique and his instructor Eric for this first adventure flying an airplane solo. Henrique took Cessna 61637 off Runway 31R for 3 full-stop takeoffs and landings with Eric watching carefully from the sidelines. 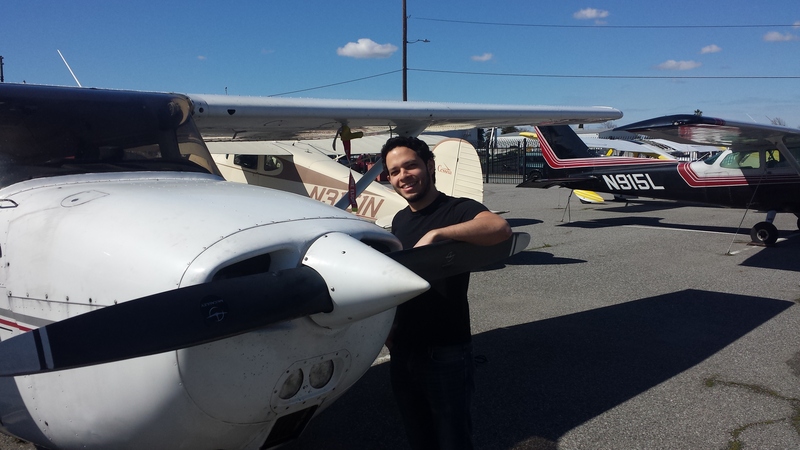 Next up…cross-country flight training, more solos, and then checkride preparation. Have fun! When one teaches as much as David Waksberg, it makes sense he would have fun traditions for soloing his students. 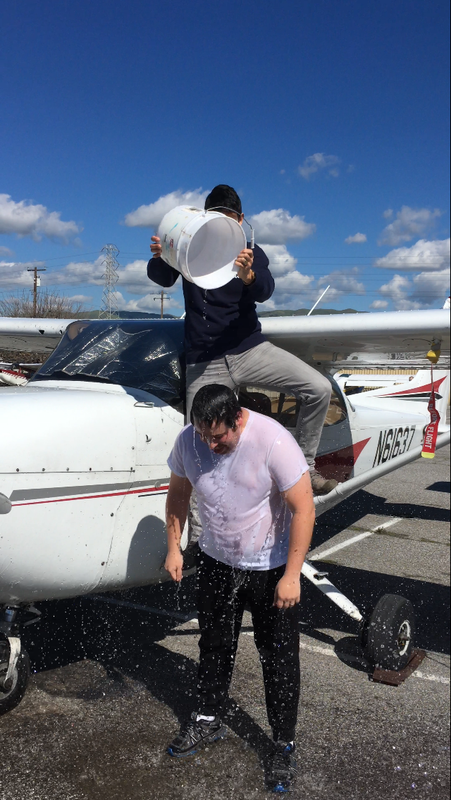 Student pilot Dmitriy experienced first-hand the bucket-o-water after his first solo flight at Reid-Hillview Airport! While we don’t condone wet T-shirt contests ;-), we do enjoy hanging solo shirts on our office wall for a time, even if they are dripping wet.